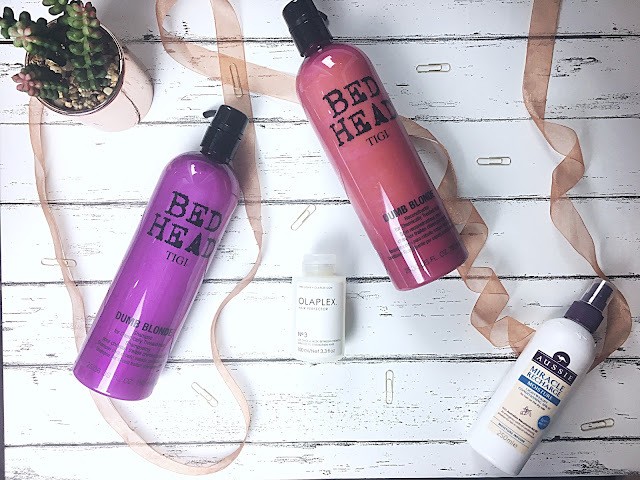 I have recently been trying out new hair care and have fallen in love with some specific hair products that are focused on restoring the hair where it is dry and damaged. Notino have thousands of brilliant hair care products which are highly discounted and affordable. I think this is possibly one of the best shampoo and conditioners I have ever tried. Not only are the products amazing but the scent is so lovely. The fact that my hair feels nourished simply using the shampoo emphasises this range ability to repair and reconstruct. The one thing I realised was how easily this was to lather into the hair. I then like to use the Dumb Blonde Reconstructer conditioner which transforms my hair from dry to hydrated and nourished. Olaplex's formula is a system which permanently rebuilds the damaged disulphide bonds in your hair that are broken during the chemical process, i.e. dying and bleaching. If you have over-bleached then olaplex rebuilds strength, structure and integrity. The olaplex series allows colourists to take hair from black to blonde instantly with minimal damage!! I think using leave in conditioner is the best way to inject shine and softness back into the hair. Although, I am not convinced these types of products actually help to restore and repair hair, it definitely helps in the short term to leave hair looking healthier and happier. I love the Aussie ranges in particular the miracle moist range because it smells like almonds and vanilla which I particularly love. What are your favourite products to maintain dry or damaged hair?